In light of the recent trend of organic content creation on Instagram, classic studio shoots have taken a back seat to iPhone images and the return of the film camera. For this particular project we worked with Kira Productions, a Cairo based production agency founded by Mahmoud Kira, specializing in Event Management, Media Production, Digital Content Creation, Branding, Social Media management and many more communication and tech services. Kira’s next goal is to venture into Fashion Production and the planning and execution of editorial shoots. Choosing to work with our frequent collaborator and friend of the magazine, Stylist and Blogger Yasmine Kenawi, this shoot is one amongst a series of fashion editorials produced by Kira and styled by Yasmine. The idea for this particular shoot was to go back to basics. To play with color, cut and fit of the clothing, through incorporating local brands and color blocking our outfits to create looks that appear bold and timeless. We chose to shoot in a studio, something both Yasmine and I hadn’t done in a while, in order to bring back that almost vintage feel of studio backdrops and blank space. The colors we chose to highlight were red, blue, green, orange, black, yellow, and purple. 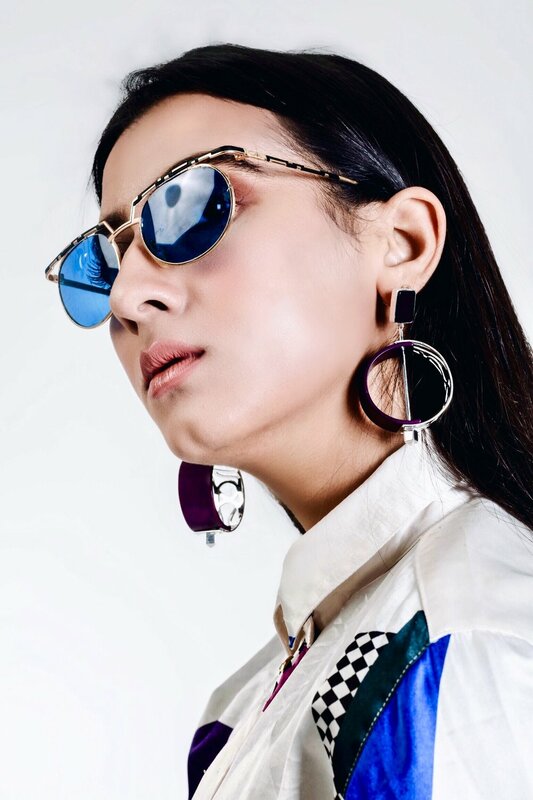 The shoot featured pieces from local brands Jude Benhalim, OKHTEIN, Sold, VNTG Sunglasses, as well as high street brands such as Bershka, Nasty Gal, Zara and H&M. Studio shoots will always have their purpose, and having been working on location for almost six months straight now, it felt good to return to a studio where shooting was done with a plain white back drop, make-up took place in front of a bulb lit glamour mirror and stool, and you could hear the crunchy sounds of lights, camera and action as the obscure umbrella lights flashed away one after the other. — PANTONE 18-3838 ULTRA VIOLET, PANTONE® COLOR OF THE YEAR 2018.